The 18th Annual Salute the Stars luncheon on May 6, 2016 at Sports Authority Field. It was a picture-perfect Colorado day. 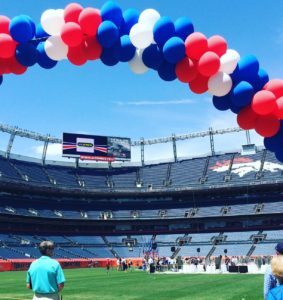 The sky was crisp blue and the sun was shining over Sports Authority Field. It was the perfect setting for this year’s 18th Annual Salute the Stars luncheon. Every year, the John Lynch Foundation along with the Reiman Foundation and Four Point Energy, host the event to celebrate outstanding student-athletes, including those with special needs, from around the state for their contributions and achievements in the classroom, on the field and in their communities. 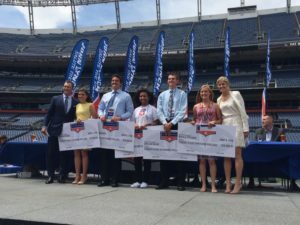 John and Linda Lynch of the John Lynch Foundation award scholarships to several student-athletes on May 6, 2016 at Sports Authority Field. Also inspired by these incredible student-athletes was another young athlete and this year’s featured speaker, four-time Olympic gold medalist Missy Franklin. She told recipients she was proud of their hard work and determination. 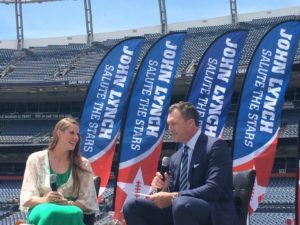 Olympic gold medalist Missy Franklin speaks with John Lynch during the 18th Annual Salute the Stars luncheon on May 6, 2016 at Sports Authority Field. Scott Reiman and the Reiman Foundation have always been supporters of educational programs and opportunities where all students succeed.